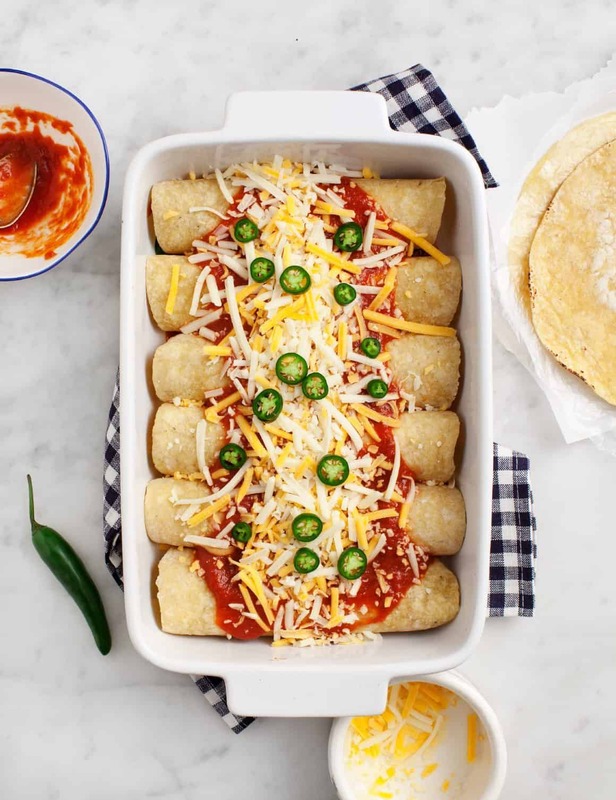 Hearty and healthy enchiladas with a spicy tomato chipotle sauce. Vegan option. Happy Friday from super-freezing Austin! Yikes, it got way too cold here yesterday and I’ve been bundled up in the house ever since. 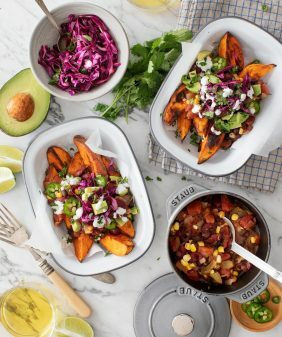 Last night, we stayed in, ate veggie bowls with roasted sweet potatoes and “vegged” out on the couch. Unlike some enchiladas, these are pretty simple to make. And to make things even easier – this recipe is available next week from The Purple Carrot, which means that you can click over and order this recipe (plus a week’s worth of other delicious plant-based meals), and the ingredients will come to your door pre-measured ready for you to cook and assemble without leaving your house. The only difference is that my version here has cheese – the version you order will be a delicious vegan version!. Order by next Tuesday, December 13th and type in the code LEMONS25 for $25 off your first order! 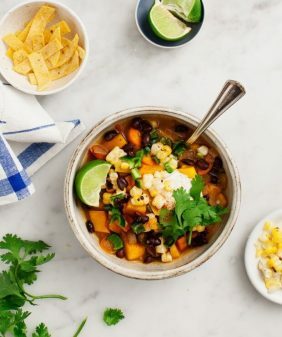 The filling here is a mixture of roasted butternut squash, black beans, and scallions (although I think sweet potatoes in here would be delicious as well). Roll it up in corn tortillas and smother them with this smoky tomato-chipotle sauce. Top with cheese if you like. Note – pictured here is not the vegan version, but there is a vegan option in the recipe below. Make the filling: Spread the butternut squash cubes on the baking sheet. Drizzle with olive oil, add a pinch of salt and pepper, and toss to combine. Roast until golden brown, about 25 minutes. Transfer the roasted squash to a bowl and stir in the scallions and black beans. Make the sauce: In a medium skillet, heat the olive oil over medium heat. Add the tomato sauce, garlic, and adobo sauce. Let simmer for about 5 minutes, stirring often. In a 9x13 inch baking dish, spread 2 tablespoons of the tomato sauce on the bottom of the dish. Assemble the corn tortillas with about ½ cup of the filling, a tablespoon of the sauce, and a sprinkle of cheese. Roll each tortilla and place seam side down into the baking dish. Pour the remaining tomato sauce over the enchiladas, and sprinkle with the remaining cheese and the jalapeños slices. Bake covered for 20 minutes. Uncover and bake for 5 more minutes, or until the cheese is bubbling. Serve with fresh cilantro, avocado slices and lime slices. Vegan option: skip the cheese and serve the enchiladas with vegan sour cream mixed with a squeeze of lime on the side. I never know whether it’s a “Big Night” (the movie) thing or what, but to me, the tortillas for enchiladas must be well-dipped in the sauce. That’s how it was in the Mexican restaurant where I worked at age 15, and so it must be forever. Squash plus black beans plus corn tortillas smuggled to France from a real tortilleria: YES. I LOVE this recipe. 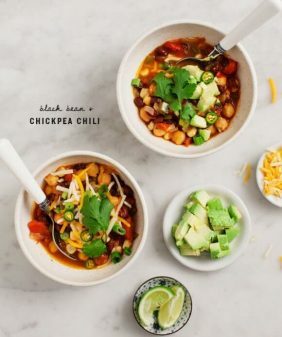 Definitely one of my faves in your cookbook! It looks delicious, I have no idea how I overlooked it in your book. Hi Kristin, I wouldn’t say this is overly spicy. The adobo sauce in the sauce is the only thing that’s spicy – instead of 3 tablespoons you can use 1 (or add it to taste). And just skip the jalapeños! So excited to try this! It looks amazing. Thanks for the recipe! 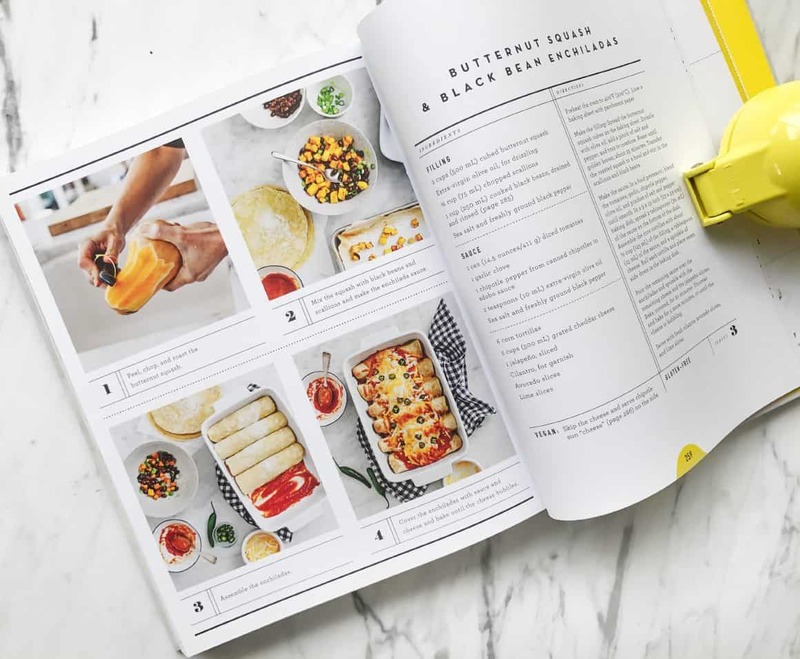 Love your blog and am loving your cookbook this winter too! I’m wondering – what is the bright yellow contraption that you’re using to hold your book open in the second picture from the top of this post? Would love something to hold my cookbooks open while using them! Ha, it’s just one of those lemon squeezers – it was laying around, it was heavy and I was trying to take the photo by myself :). So glad you’re enjoying the book! 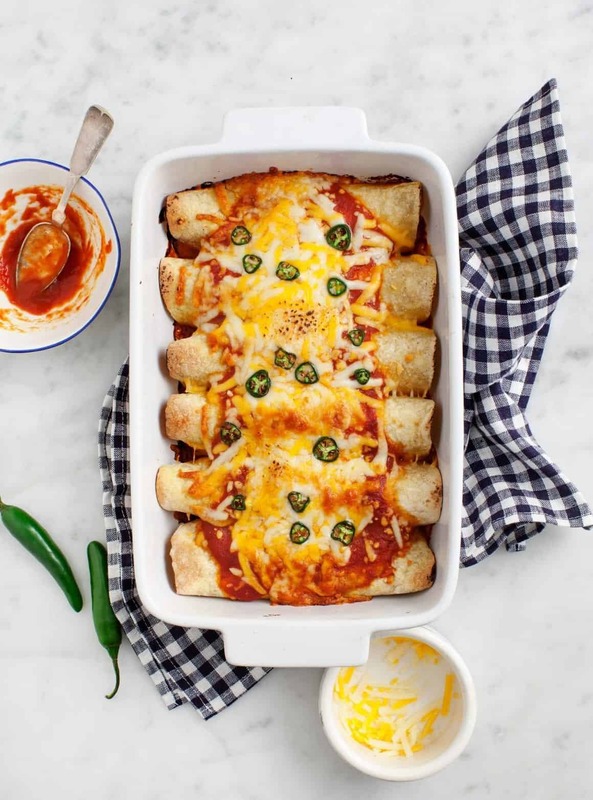 Just made this for dinner and it’s super tasty, not heavy or greasy like traditional enchiladas! Thanks!! Hi Lynn – I’m so glad you enjoyed these! 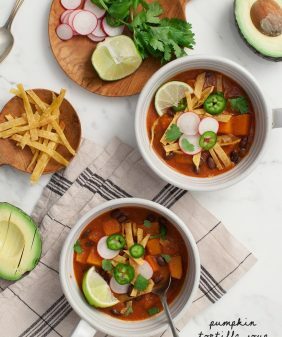 A good amount of snow and (even) chillier weather is headed my way this weekend — I’m excited to be snowed in with a good book, a few movies, and this recipe!! 🙂 Thanks for sharing! I decided to make this as more of a casserole dish and it was fantastic! All the flavors and textures melded perfectly. Thanks for the recipe! Great Winter Recipe. I will definitely be giving this a try. 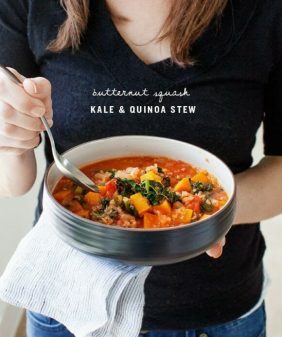 I love butternut squash and using it in different recipes is something I’m always trying to do. 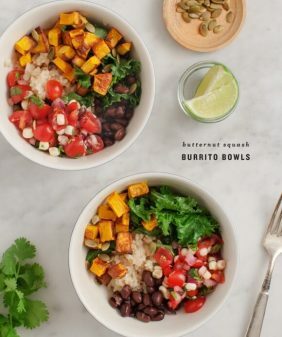 This looks so yummy I am excited to try this love enchiladas and love butternut squash so it got to be good. I was wondering if I could use Chipotle seasoning instead of the adobo sauce. Hi Kellie – you can, especially if you have a seasoning that you really love. I’ve always found chipotle powders to be more spicy and not as smoky and flavorful as the can of chipotles in adobo. But in a pinch, it will work. I’d just add it to taste. Hope that helps! Tried this meal for the first time last night & it was absolutely delicious. A hit for my husband & I plus our guests loved it! This is one of my favorite recipes from your cookbook and I make it often! I’m doing a lot of freezer prepping before I have my second baby in July, and I want to make a couple batches of this and freeze it. What do you think about freezing and thawing/would cooking temp and times remain the same? I made this recipe last night. Quick, easy and absolutely delicious! Is there a secret to getting the corn tortillas to roll? Since they’re small and fairly brittle they cracked and made for more of a delicious enchilada casserole, but would love to figure it out for future recipes! If I freeze this would I do before or after sauce? Or if I made before work do you think it would be ok sitting all day, then saucing and baking? Thank you! Wow!!! This recipe is amazing. Instead of corn tortillas we used flour, and instead of squash we used sweet potatoe and added green pepper. For the sauce I had fresh tomatoes that were getting very dark so I went ahead and made my own (very chunky and spicy) sauce out of those and used it instead. This is definitely a recipe we’re going to make over and over again. So so so delicious! (Currently eating the leftovers, STILL AMAZING A DAY LATER).